iPhoto and the newer Photos are the only photo management software that take your photos captive and doesn’t let them go without a fight. Once you start using iPhoto (and everyone who has an old Mac uses iPhoto to some degree or another), iPhoto will store your photos in the locked iPhoto Library folder. But what can you do if you want to move away from iPhoto? As a consequence, you cannot simply move your Photo Library sub-folders and afterwards delete them. The reason is that iPhoto locks the iPhoto library and this means you cannot see or change what is inside the iPhoto library. What do you do then? How do you get your pictures out of iPhoto so you can rename the folders so that they make sense and help you? 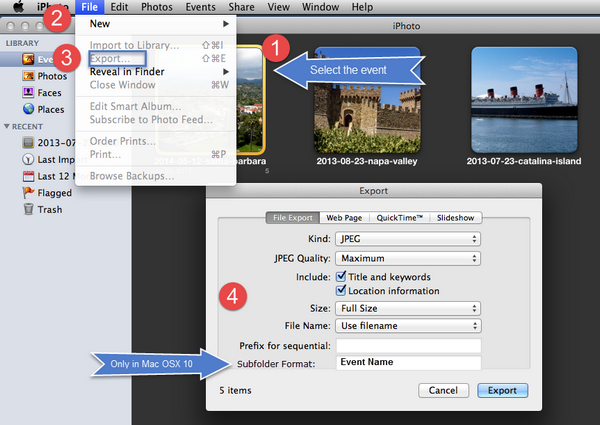 The first thing you should do is to start using iPhoto efficiently and prepare your events for export. This is the easiest way to get prepared since you are already familiar with iPhoto. If you don’t cleanup your events with iPhoto, then you must start organizing your events after you export with whatever program you decide to use (Picasa or Lightroom for example). Secondly, it would be great if you can decide if you want to keep your events still in iPhoto in addition to exporting them. This essentially creates two copies of your photos and they will fill up your hard drive very quickly. However, if you are nervous about deleting your photos from iPhoto, you can keep them in both places until you decide. Thirdly, when ready to export your event, follow the steps in this article in order to export your events from iPhoto the right way and avoid a lot of work afterwards. The goal is to create an organized set of event folders on your hard drive which are easy to find and visually navigate. Then you can use any other software (like Picasa or Lightroom) to view them without taking them captive. My video course has specific step-by-step videos on how to use iPhoto efficiently and how to export your events from iPhoto (Click here to learn more about my course). If you decided to delete your events from iPhoto (step 3), then you don’t need this step. If however, you decide to export your events AND keep them in the iPhoto library, you need a way to keep track of the photos you have exported. In iPhoto create a tag called “exported”. As you complete the following steps and export your events tag the exported event folders with this tag so you can keep track of what you have exported already. Unfortunately, tagging an event does not tag the event itself but all the photos in the event. Make sure iPhoto displays your keywords. On the iPhoto toolbar on top click the View Menu and then select Keywords. Or you can simply click the “Info” button on the bottom right of the screen. The Info panel with a place to enter keywords will appear. Select an Event. Add the keyword “exported” to the event. A keyword that’s added to an Event will be added to all the photos in the Event. If you want to apply keywords to individual photos select a photo or group of photos. If you select multiple photos, then the keywords you enter will be applied to all the photos. Click the Info button in the toolbar to open the Information pane. In the Information pane, click Keywords, click “Add a keyword,” and then type your keyword into the Keywords field. Once you added the keyword “exported” to the event, you are ready to export it. 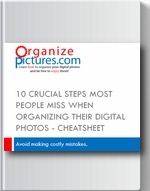 The very first thing you have to do is to establish another main folder as the new place for your digital photos. Using Finder, inside your Pictures folder create a sub-folder called FROM-IPHOTO. This way you can make a distinction between new photos from your camera and the ones from iPhoto. Secondly, use iPhoto and export your event folders to this new folder. You can select all your iPhoto events (which are just logical categories…nothing on your hard drive) and choose the export function. You must export the entire event. So, you must be in the Events view in iPhoto and select the event you want to export. Then choose File / Export to folder, choose “JPEG” in “File type” (or “kind”) (if you have created image metadata see my next note) and then click “Export” and then choose your destination folder which is FROM-IPHOTO. It might take a while. If you have created keywords and places in iPhoto you Must choose JPEG in the export screen. 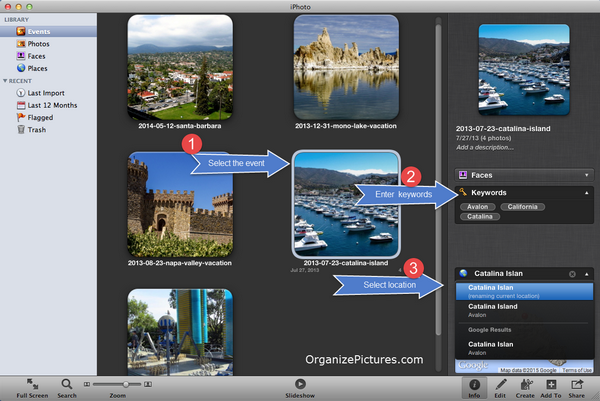 If you choose “Original” in “file type”, iPhoto will NOT embed the keywords and GPS data in your exported photos. The only way to embed meta data in your photos with iPhoto is to export them as JPEG. This means that your photos will be re-compressed and the quality of your photos will decrease…not much, but the JPEG compression algorithm will be applied again upon export. Make sure you have enough room on your hard drive before doing this operation because this procedure will create another copy of ALL your pictures. If you don’t have enough space, just export a few albums from iPhoto and then delete them…and repeat. At this point you have created another copy of all your photos. IPhoto holds one copy in its Photo Library and in addition you have just created another copy by exporting your event to the FROM-IPHOTO folder. So the next step is easy! Once you exported (essentially copy) all your photo albums from iPhoto to another folder, you can simply go in iPhoto and delete all your albums. To delete an even in iPhoto select the event then hit Command + Delete or simply drag the event in the iPhoto trash bin at the bottom of the left panel. The event folder and photos will be deleted even though the thumbnails will still show up maybe in iPhoto. This operation should successfully remove all your pictures from the Library folder that iPhoto uses as the main place for putting all your pictures. If you are nervous to remove all your photos from iPhoto, then you can do this step last after you have migrated and organized everything in your folders outside of iPhoto. While iPhoto does take your digital photos captive by default, it does provide some simple settings that make it play nicely with other software you might want to use for managing your photos. 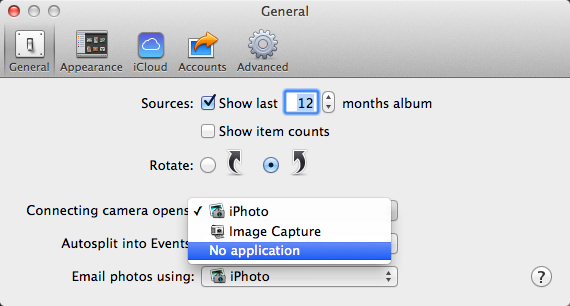 There are two settings that you have to perform in order to make iPhoto leave you and your digital photos alone. Normally iPhoto comes up every time you connect your phone or camera to your Mac. If it is a camera it will also start downloading your new photos to your Mac. This is very annoying especially if you are using a different program for managing your photos. Simply open iPhoto, click on the iPhoto menu option in the upper left corner of your screen. Then Preferences, and at the bottom of the first menu it pulls up you’ll see an option that says Connecting camera opens. Chances are it’s set to iPhoto, which is why it opens all the time. Just change it to No application. Keep in mind that, while this settings prevents iPhoto from opening automatically, your connected devices will still show up when you open the program manually. And you can still bring up iPhoto manually and transfer your photos. Here is how you can set up iPhoto so that it can just look at your own photo folders instead of imprisoning your photos in the locked iPhoto Library folder. Bring up iPhoto then File – – > Preferences – – > Advanced / Importing / Uncheck the “Copy items to the iPhoto Library” check box. Now iPhoto will not be copying all photos to its locked storage folder and you become responsible for transferring photos from your camera to your computer. And iPhoto will leave you alone. If you have chosen not to save your files to the iPhoto Library then you become responsible for storing your photos to your hard drive and backing them up. You are on your own now, so if you don’t know how to store and organize your photos maybe you shouldn’t do this. If you are uneasy about moving your files out of iPhoto, you can first learn how to use iPhoto somewhat efficiently. Then, once you learn how to cleanup your events in iPhoto, you can move away from iPhoto confidently. Whatever software you decide to use instead of iPhoto (like Picasa for example, or Lightroom), make sure that you only use that software for importing new photos…instead of iPhoto. Once you have exported your organized events from iPhoto make sure you setup another folder to help you with transferring new photos from your cameras. In other words, once you get your photos out of iPhoto, stop using iPhotos. Otherwise, you will have to repeat this procedure. Setup that software so that it will transfer your new digital photos from your camera to the new folder you have created…the one you used for exporting (Pictures/TRANSFER). Whether you use Picasa, Lightroom or Aperture, set it up so all new photos will use the new TRANSFER folder as the destination for photo transfer. ...lots of sub-folders from iPhoto. Once your pictures have been exported, examine the folder names you have in your new folder structure. If you have not used iPhoto to cleanup and organize your events prior to exporting them, you must start organizing these events that you have exported (Read Tutorial 2 – Creating an efficient folder structure). For examples how to setup your photo transfer with Picasa, read this article. iPhoto is a powerful program for managing your digital photos. Unfortunately, Apple has made some decisions for the sake of simplifying your digital life, but with these decisions they have essentially taken your digital photos captive. The good thing is that you can export your pictures out of iPhoto and use something else…anything else that will allow you to rename your folders to something significant. Thank you so much for your very detailed and informative article. I can’t wait to get to work this weekend on getting OUT of iPhoto and moving all my images to Lightroom on my Macbook. Jody…you are welcome! Just remember that you are simply moving the photos to the Pictures folder from the locked folders that Photos controls. Lightroom will only be looking at them in the new location. It will be much better when you actually control the storage. Bless you!!! I’ve been ripping my face off trying to migrate my pics to Drive. If I weren’t afraid of Android-type things, I’d get rid of all my iStuff. So sick of Apple making life so hard. Apple is convinced they are making things easy unfortunately. This is why when they have redone iPhoto and called it Photos they didn’t change anything fundamental way the program is working…they just focused on better integration with the iPhone. My issue has been that I lose the original dates associated with the pictures when I export from iPhoto. Will exporting by ‘event’ fix that? Or is it just a setting I’ve missed? Sheri…in my experience using the Event Name in the subfolder format field will create a folder with that event name in your export folder. So if you put the date in the event name as I have in my article, your exported folder name will have it as well. The date is not added automatically…you have to add it manually to the event name. 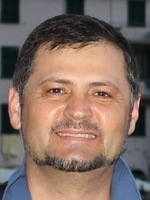 See my article called:l 5 steps for using iPhoto somewhat efficiently. Not sure what you are trying to accomplish but I have added instructions for adding keywords in iPhoto in step 2. Please note that my articles are usually short and they do not provide detailed click-by-click instructions for every software program. Rather, I am trying to provide a direction and a system for accomplishing certain goals. Tx for this. I have a category folder in Events in imovie 09 it says “iphoto. Imovies”. How do I delete the clips within iphoto folder in events? I have tried everything. Is synching them to delete them out of events the correct way? Terry… Does hitting Command + Delete only removes the folder from iPhoto but not from the disk? There is a menu option that says something like: “show in finder”. Depending on your iPhoto setup you may be able to delete the folder in Finder.